Back around Christmas, friend and fellow film blogger Exactly Why reviewed Robert Montgomery’s “Lady in the Lake” (1947) and reminded me how much I love those classic noirs with highly unclassical approaches. Specifically, “Lady in the Lake” is shot almost entirely from a first-person perspective with Montgomery’s Philip Marlowe appearing only at the bookends and in mirrors. The film, fittingly, is set at Christmas time. The second-person narration not only helps fill in for professional assassin Frankie Bono’s trademark taciturnity, but it forces us to imagine ourselves in the shoes of a methodical killer. The film may have influenced the silent-cool antiheroes of Jean-Pierre Melville’s later noirs (like “Le Samurai”), but while Melville’s reserve promoted existential alienation, Baron’s narration asks us to empathize with a monster on the brink of reform. The use of repetition in the voice-over mimics the habits of the mind, helping us enter into the day-to-day operations of Bono’s job. “Watch it now!” and “Danger sign!” are probably the most common exclamations; giving us some hint of the subconscious mechanisms Bono uses to scan his environment for trouble. These interruptions play a key role in triggering tension moments before an action scene or a sigh of relief (“Your hands are sweating inside their gloves, but you know why…”) and also give the film a certain pleasurable cheesiness. Another oft-repeated opener, “Remembering…,” leads into revealing ruminations on Bono’s past as a pre-cynical orphan and the circumstances that led him to become a cold-blooded killer. Allen Baron’s performance as the lead is necessarily restrained, as a certain level of blankness must to be sketched in by the viewer’s self-projection. One consequence, however, is that Larry Tucker’s Ralphie, an obese rat-breeding gun-dealer who aids and then blackmails Bono, steals every scene he’s in. His wheezy, unctuous delivery is in perfect contrast to Baron’s icy clipped speech and Tucker uses it to create a beautifully idiosyncratic characterization. Ralphie also helps to deglamourize the depiction of crime, giving a glimpse of the seedier side of Bono’s underworld just when he is most susceptible to the lure of domesticity. 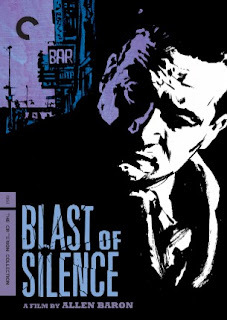 “Blast of Silence” is also notable for its New York City location shooting. Baron strides confidently through the winter crowds, hands jammed firmly in his trenchcoat pockets, as he takes in the city and growls inwardly at the people around him. He thinks of himself as completely detached from the rabble, but is clearly an urban creature. The point is driven home in the film’s fatalistic conclusion, where Bono is isolated in a marshy ghost town outside the city proper. “Blast of Silence” is a little rough around the edges, but the flaws give it immediacy not present in the smooth surfaces of Melville or the choreographed set pieces of modern action films. Like “Lady in the Lake,” the experimental perspective isn’t always successful either, but it gives the film a place a cinematic history it might not otherwise fully deserve. Despite these quibbles, the Criterion transfer now available makes “Blast of Silence” a must see for film noir aficionados. Gosh, how many movies DO use second-person perspective?! Well I got sick and dropped off the world before I could try to guess what your post would be. Sadly, I have not seen it, but it's definitely on my list now. Second person movies have to be pretty rare. I suppose you could make an argument for Lady in the Lake since Robert Montgomery keeps talking about how You are trying to solve one of his cases in all his distracting, talk to the camera interruptions. Not many, although Wikipedia has an interesting list of novels written in 2nd person. Hope you are feeling better! I want to do more noir cross-posts with you soon. You don't even know how happy I am that you pointed out Zentropa. I almost referenced it myself as the only other example that came to mind, and the fact that you had the same reaction is awesome. Plus it's a great movie, too.